← A Banana Bread Perspective …the past….present…future…. This entry was posted in animals, Loving kindness and tagged Animals, Appreciation, Love. Bookmark the permalink. This cat really has lots of poses… she’s a very funny kitty! 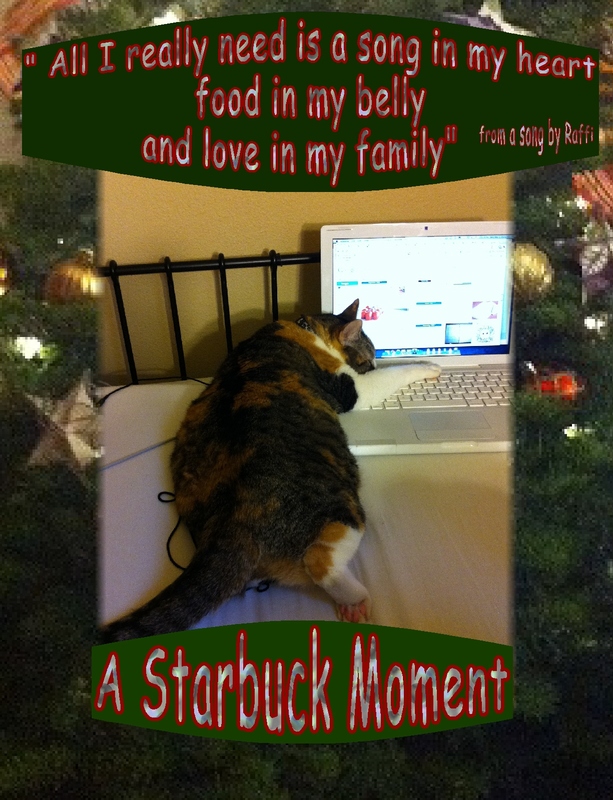 Starbuck meowing at her window resulted in a blessing for both of them…. How sweet of your daughter to take in puddy! Now she’s a celebrity kitty living fat and happy! LOL!! Hi Marie…She does have a wonderful heart…. and it’s turned out so nice for both she and Starbuck! What a chubby cat–must be well-loved! How wonderful for Starbuck to have come to your daughter’s door. I once lost my rescued cat during winter . . . I hope he found someone like your daughter. Ohhh…I hope your kitty found a loving home, too. Aww she’s a cute kitty! 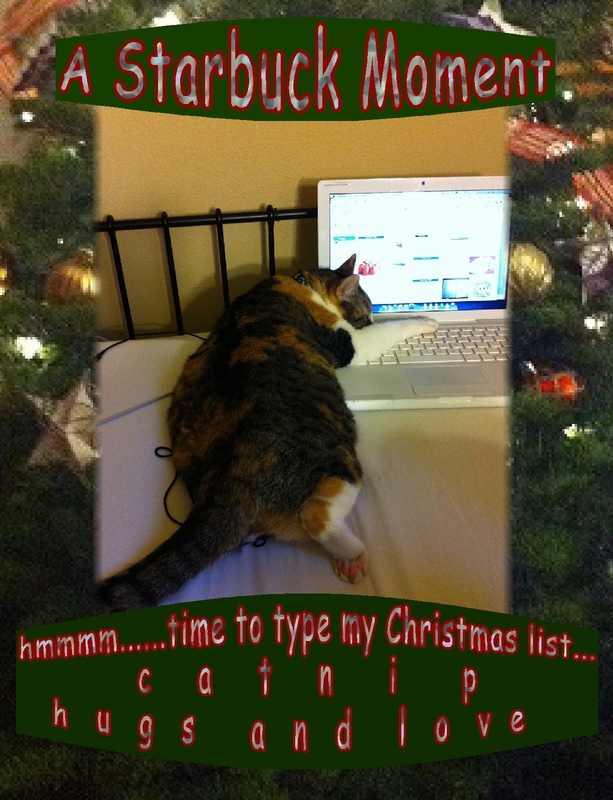 And I love her Christmas list. 🙂 My friend Luke recently took in a cat that he found abandoned. She is very small and very fearful and goes into hiding whenever he has people over. We met her for the first time last week and she hid from us for a while, then occasionally would watch us from down the hall around the corner, then eventually got close and started playing with the ball of string my brother was holding up for her. That was cute. Then she’d return to hiding, then creep back. Near the end Luke brought her out in his arms and let me pet her, and usually she tries to run away but when I was petting her she relaxed and was purring actually! It was really cool and Luke said that’s never happened before. I guess we just made some sort of connection and she trusted me. He named his cat Willow.